Just about everyone in "Gimme the Loot" seems to be yelling, even when they're just talking. Maybe that's because you have to raise your voice to make it heard above the constant din of life in New York City. If you don't speak up and make your mark, you'll be swallowed up and lost in the vast massive noise of it all. This is a simple, meandering, slice-of-life indie film that feels more authentic than most "gritty" New York films with infinitely larger budgets. It's funny as hell, sometimes too self-consciously "indie" — but it leaves us with a final shot as perfect as anything I've seen to close a movie in quite some time. Writer-director Adam Leon has a natural, casual style that makes us feel we're eavesdropping on the lives of Sofia (Tashiana Washington) and Malcolm (Ty Hickson), platonic friends determined to make names for themselves as graffiti artists in New York City. Indulge me while I hit the pause button. There's a tendency by the mainstream media to glamorize "taggers" as free-spirited outlaw artists creating instant art as they express their hopes and dreams. (In a big-time soft-drink commercial currently airing, a "security camera" captures a graffiti artist writing "PEACE" on a store window. So because his message is positive, it's a cool move?) And, yes, sometimes that's true — but more often, taggers are vandals marking gang territory. Fortunately, "Gimme the Loot" makes no moral judgment about Sofia and Malcolm, neither lecturing us nor aggrandizing them. They're petty criminals, and they're looking to commit more serious crimes, but they're also just a couple of teenagers roaming around a huge city that doesn't know they exist and couldn't care less what happens to them. They're not mean; they're not even completely hard-boiled, at least not yet. Options still await them, and we don't know which road they will eventually take. Sofia is tough and smart and feisty. Malcolm is charming, and he talks a big game and has plenty of swagger, but he's also a bit of a goof who finds himself embroiled in comically ill-conceived capers. Feeling disrespected after a rival team paints over their signature tags, Sofia and Malcolm hatch a plan that will put them on the graffiti map forever: They're going to tag the enormous red apple at Citi Field that rises up every time a New York Met hits a home run. (Like diehard White Sox fans who still call U.S. Cellular Field "Comiskey Park" or even "Sox park," these legacy Mets fans still call Citi Field "Shea Stadium.") But they need $500 in the next 24 hours to grease the skids for entrance into the field, so they embark on a series of capers, including an effort to fleece an upper-middle class Manhattan girl (Zoe Lescaze). 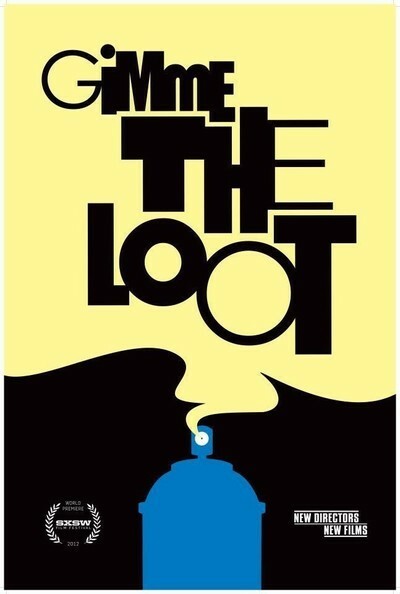 Whenever "Gimme the Loot" presents us with a potential movie cliche, e.g., that white Manhattan girl, it puts a different spin on it. And Leon's camera is almost a character unto itself, bobbing and weaving and circling as it follows Sofia when she tries to retrieve a stolen bike, or when she nearly collapses from exhaustion by trying to tail that rich girl while acting as a lookout for a hilarious attempted robbery. At its heart, "Gimme the Loot" is about the relationship between Sofia and Malcolm. We're left hoping they can lean on each other to dream of even bigger schemes than leaving their signature on a big cheesy apple.